Catholic Relief Services (CRS) is assisting thousands of South Sudanese forced to leave the homes that sheltered them and the fields that fed them as a result of almost two years of violent conflict. While providing emergency food, shelter and access to safe drinking water, CRS’ critical long-term development work in areas not affected by the violence also continues. Parts of South Sudan have been embroiled in brutal conflict since December 2013, when a dispute between factions of the governing party escalated into armed aggression. As the nation’s president, Salva Kiir, and former vice president, Riek Machar, fight over power, millions of innocent people have been displaced from their homes. That violence also threatens aid workers. Combined with the onset of the rainy season that lasts from June to October, it will make it difficult to get aid to the many in need. Repaired dozens of wells, and formed and trained community committees to manage the use of these boreholes. Distributed household, hygiene and shelter kits to 13,458 families. Trained thousands of farmers on post-harvest storage and provided 4,000 bags of grain in Bor County. Formed and trained Savings and Internal Lending Communities (SILC) groups, which allow the poorest of the poor to improve their financial independence. In addition to the life-saving emergency assistance, long-term development in South Sudan must continue for South Sudanese to become more resilient and self-reliant. The areas affected by the current violent conflict are places that were already among the poorest on earth due to decades of war between what is now South Sudan and Sudan, the country it was once part of, now its neighbor to the north. Without peace, farmers can’t farm, children can’t go to school and people can’t work. 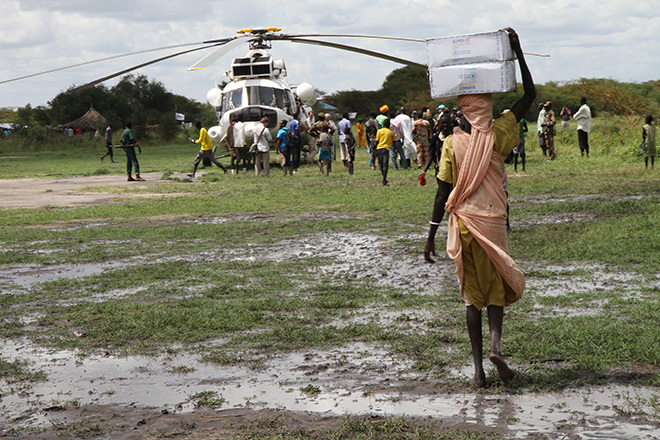 Without peace, South Sudanese will face an increasingly dire situation of hunger and starvation. More severe food insecurity is expected if current humanitarian assistance is not continued and expanded. The Church has always played a central role in South Sudan. It was crucial to the peace agreement that led to formation of this nation. For decades, it has often been the sole provider of basic services – education and health, for example – and is continuing this important role today. Because of its credibility, capacity to serve and its vast network in the country, the Church reaches a great number of people, many of them not served by any other civil or government agency. CRS continues to work alongside the Church to help the most vulnerable in this conflict, fortunate to have such a vital partner in providing immediate relief to communities, as well as the means for people to rebuild their lives and country.